Since the day Rosalyn opened her eyes, until now that she’s 8 years old, this is what she has been seeing – garbage everywhere, wet and sticky ground filled with plastics, and a repulsive stinky smell that seems to be a combination of smoke, piss, poop, and rot that envelope the whole area. This is what Barangay105 Happyland Tondo feels like, the place where Rosalyn’s family lives... and this is her playground. Most of the time, she and her brother play tag outside their house, along with other children, exposing themselves to the infested garbage around them. 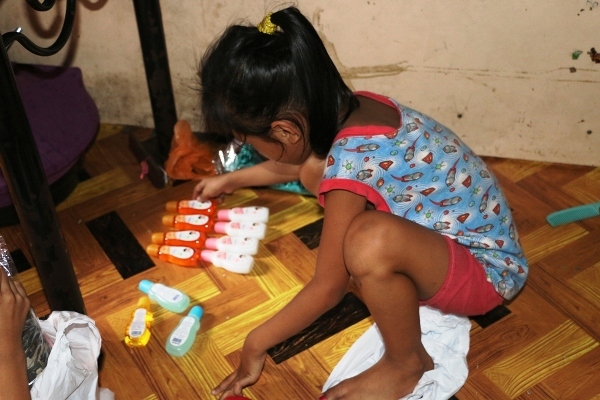 Their mother, Hannylyn always reminds them not to stay outside for so long, and instead, just play inside their house to avoid the filthy environment, to avoid getting sick. Their house is inside a very big building compound together with the houses of other families. They do not have their own toilet. What they have is a public toilet for everyone in the building which no longer functions very well. It’s clogged. So how do they manage? “Ang ginagawa po namin, sinusupot (yung dumi namin) na lang po. Tapos itatapon… sa basurahan,” Hannylyn answers. Happyland of Brgy 105 is undoubtedly one of many depressed areas in Tondo. Some families scavenge and eat pagpag (left over food from trash). One would see thin and underweight children everywhere, just like Rosalyn - severely wasted, as nutritionists would call them. She only weighs 18 kilograms, too light for her age. The food and the place are not the only problems for these children. Clean water is not available. With this kind of environment, children are prone to parasites -- Soil Helminth Infection. In a depressed area like the Happyland, over 50% have worms in their digestive tract. “Malaking problema talaga. Paano natin maiwasan na paulit ulit na maimpeksyon ang bata? Kailangan, health, hygiene, education sa mga bata,” Dr. Aquino says. 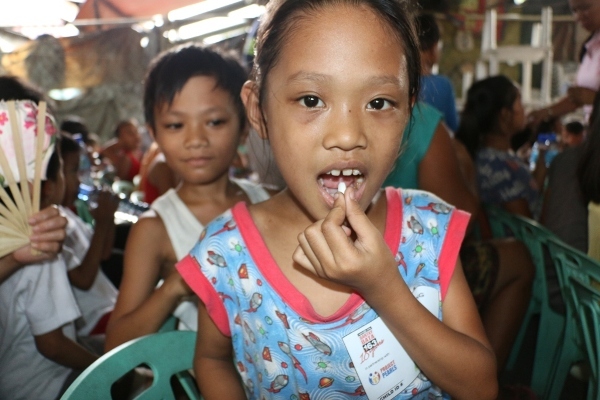 In order to help, Bantay Bata 163, together with Project Pearls, did a deworming activity in Happyland. 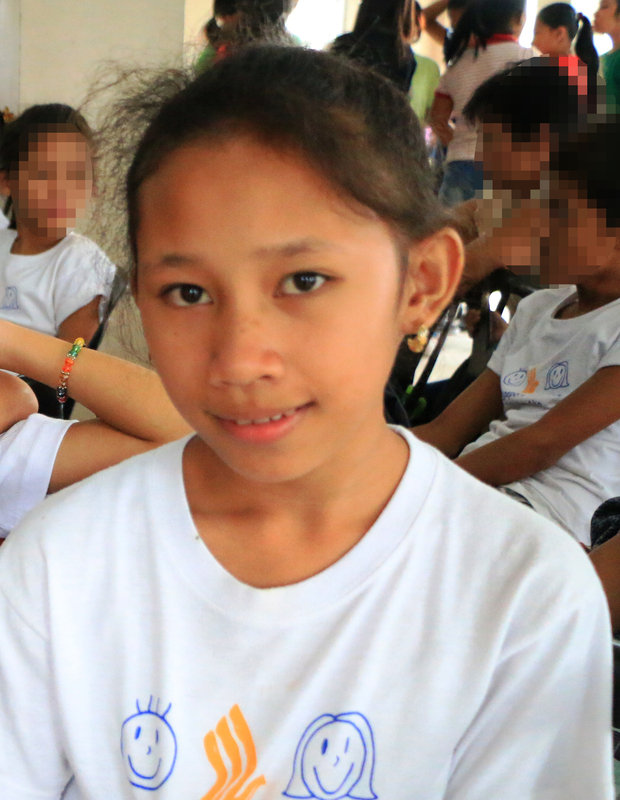 Rosalyn was among the more than 100 children who were given a deworming tablet. She knows it isn't a piece of candy but a medicine for she has already experienced deworming activities in school. Actually, it was more than a deworming activity. Rosalyn and the other kids with their parents were served healthy and delicious meals -- pancit and chicken teriyaki, partnered with drinking water. Clean. Potable. Teaching the children about their rights was also a part of the activity since most of the time, abuse happens in depressed areas. Rosalyn and the other children also enjoyed playing the games prepared by Bantay Bata and took home gift bags containing new clothes, toys, and different personal hygiene products. Rosalyn's mother muses, "Malaking tulong na rin ito. Kasi yung iba rito, yung mga anak nila, may sponsor. Eh sa lahat ng anak ko, walang sponsor." It might have been a short activity but already, an impact is made. Even just for a day, within a few hours, Bantay Bata 163 with its partner Project Pearls, has given joy to the children and made Brgy. Happyland a true happy land. And it would be a happier land if the children and their families can be out of danger by having a clean place to live in.